When one of cinema's greatest directors unites with its greatest living actor to make a film about the most iconic figure in American history, it's fair to say that expectations are high. Steven Spielberg's Lincoln exceeds these expectations by subverting them; instead of making a fawning biopic of Abraham Lincoln, Spielberg has delivered a dense, dialogue-driven exploration of political process. The sentimentality and heavy-handedness that has sometimes marred the director's previous historical films is pleasingly absent here, with his restrained directorial approach largely allowing Tony Kushner's script and his impeccable cast to drive the film. Even the score from John Williams feels unusually reined in. Perhaps this pared-down and focused approach was simply necessitated by the story Kushner and Spielberg have chosen to tell. 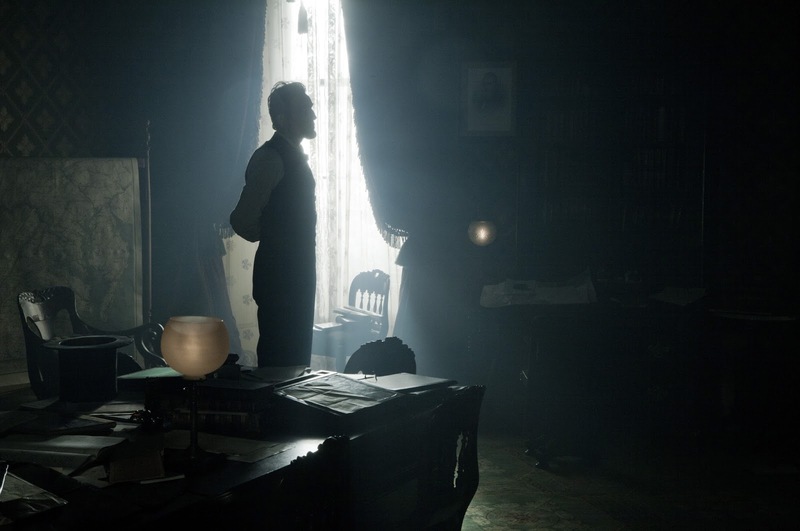 Although it opens on the battlefield, Lincoln is a film that largely takes place indoors, in the buildings of government, where the conflict is verbal rather than physical. Lincoln takes us through the last few months of the 16th American President's life and details his fight to force the 13th Amendment through Congress, therefore ending slavery. The imminent end of the Civil War gives this action a sense of urgency that imbues the film with its drama and momentum, but even so, many audience members may be sceptical about the film's potential for entertainment. With scene after scene of bearded men sitting in stuffy rooms and discussing the fine details of the American Constitution, Lincoln sounds unbearably dry, but there's a strange alchemy at work here that elevates it into a grand, rousing drama. It is history brought to vivid life. Of course, the manner in which Daniel Day-Lewis has brought Lincoln to life is a marvel in itself. His embodiment of the man feels utterly authentic, from his slightly stooped posture to a high-toned accent that seems a little off at first but ultimately feels like a perfect fit for the character. This Lincoln has a fondness for folksy anecdotes as a means of taking a circuitous route to his ultimate point (there's a delicious moment when he embarks upon such a tale, to the chagrin of Bruce McGill's Stanton) but behind the calm and humorous manner lies a sharp strategic mind and a fierce determination. He needs those qualities to procure the two-thirds majority needed in Congress in order to pass the 13th Amendment, and Lincoln turns this quest for votes into a riveting caper. A rambunctious trio of lobbyists (led by an unrecognisable but brilliant James Spader) is enlisted to persuade wavering Democrats to support the bill, while Thaddeus Stevens (Tommy Lee Jones) trades angry speeches with Fernando Wood (Lee Pace) on the floor of the House. Lincoln aside, Thaddeus Stevens is perhaps the most fascinating character in the film. Played with just the right measure of cranky gruffness by Jones, the radical abolitionist begins the film by demanding complete racial equality but is forced by Lincoln to soften his stance in order to ease this amendment through. Through this character, Lincoln shows the compromises and manipulations that are required in politics, and the way ideals must sometimes be yielded in order to find common ground and serve the greater good. In Lincoln we see Democrats being cajoled, pressured and even bribed into switching their allegiance in time for the vote. Politics is a dirty business but Lincoln, Stevens and their cohorts were driven by the knowledge that this was their moment ("We've stepped out upon the world stage, with the fate of human dignity in our hands. Blood's been spilled to afford us this moment now! Now! Now! Now!" Lincoln exclaims), and they had to win this battle by any means necessary. The political aspect of Lincoln is more compelling than the personal one. Scenes between the president and his family are sensitively played, but these characters don't appear quite as convincingly realised and there's always the nagging sensation that there is more pressing business to attend to. Sally Field perhaps needed one more scene to make her performance as Mary Todd Lincoln feel fully rounded, and Joseph Gordon-Levitt is inserted awkwardly into the narrative as Lincoln's older son, whose desire to join the army contradicts his father's wishes. In fact, the most affecting glimpse into the private lives of these characters comes at the end of Thaddeus Stevens' story; a touching scene that gives his narrative arc a satisfying climax, and serves to remind us what was at stake for these men. Although it is bookended by its weakest scenes (typically, the director bypasses a perfect note to end on), Lincoln is a considerable triumph for Steven Spielberg, whose direction may be uncharacteristically free of the sweeping spectacle and grand flourishes we expect, but whose composition and judgement of emotion and character remains as sharp as ever. We tend to think of him primarily as an entertainer, but he has also made his mark as one of American cinema's foremost historical filmmakers, and the fact that he has managed to make a serious, verbose, ideas-driven political film on a grand scale in the current climate is something to be thankful for. This is a great film about a great man; a film driven by noble ideals and determined to show what the best of us can achieve in troubled times. Politically, personally and artistically, Lincoln gives us something to strive for.